Bronwyn McColl is principal, regional hotel sector leader and studio chair for Brisbane at Woods Bagot. 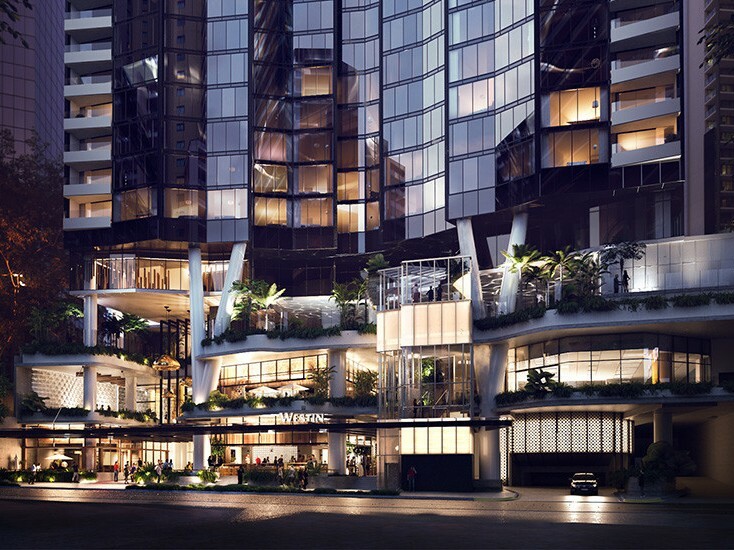 McColl is currently working on the Aquis Pacific Point and the Westin, Mary Lane projects. Architecture and Design spoke to her about the challenges of the Aquis Pacific Point project, why Brisbane is an exciting time for architecture and the art of effective communication. Can you tell A&D about the Aquis Pacific Point project and some of the challenges? will target a new generation of ‘uber-luxe’ travellers with an offering that will be instantly recognisable. The design comprises a triangular shaped architectural form. The tower’s exterior introduces a sculpted and glazed articulated façade that reflects and refracts the light to create a dynamic street frontage. The triangular site constraints were a challenge for the team trying to accommodate all that is required for hotel operation whilst addressing the street frontage and engaging with the surrounding context. How have you approached those challenges? Creating an iconic gesture to capture the imagination of guests and the community was the focus of the foyer. The three-level glass atrium will house a custom art installation created by international artist Wolfgang Buttress. The curated and integrated art approach was designed to be a feature piece that will draw guests into the lobby space, creating an incredibly beautiful arrival experience for guests. The site works incredibly hard to locate everything needed for hotel operation. We challenged the notion of traditional hotel planning and explored how we could maximise the available frontage, developing a sophisticated design solution. What is one project that you've had to approach entirely differently from other projects? The Jewel display suite on the Gold Coast. The approach was all about the design journey and promoting a project in the best light. Usually, display suites are about showcasing a development from the outside. However, due to the location of the display suite in an arcade off the main shopping street frontage, we were spatially limited from the beginning. The key to the display suite experience was creating a relaxed environment that reflected the opulence of the development and gave a taste of the Jewel lifestyle – a world away from the street outside. Our design approach looked to high-end luxury retail and exhibition design for inspiration on how to create intrigue and a sense of exclusivity. The response was a façade collaboration with UAP that explored materiality and form to create an intricately detailed façade that draws attention without revealing the luxury interior within. The interior reveals itself through layering of spaces unveiled through the sales journey. How would you define architecture in Brisbane? Brisbane is at an exciting moment in time. We have seen the delivery of some amazing projects in recent years with numerous projects currently under construction, including Mary Lane and Westin (pictured right) that we are delivering on site. Howard Smith Wharves, that we are currently working on, will be a city defining precinct, connecting into Eagle Street Pier and the Queens Wharf precinct that are all going to bring a new energy to our city. For us it shows a city that is starting to embrace the river in a new way, providing greater opportunity to inhabit the city and celebrate the amazing climate we live in. What do you hope to achieve in the Brisbane studio over the next 12 months? We have an incredibly talented and ambitious group of people in our Brisbane Studio. We have recently gone through a change in leadership. Our newly formed exec team is young, passionate and driven to create great design outcomes as well as developing a strong, collaborative studio culture. Our approach is one of inclusiveness – engaging the entire team, creating a studio culture where design is at the centre of everything we do as well as enjoying what we do. As Studio chair, one of my focuses is on providing opportunity for our people to develop meaningful careers at the practice. Collaborating with our clients and taking them on the design journey to ensure we deliver great, strategic project outcomes is also fundamental. We all joined the profession to make a difference in people’s lives. Therefore, we want to create an environment that allows us to achieve this through the design process. What has been one of the most important lessons you've learnt during your career? The art of effective communication – an ongoing lesson. Understanding people though talking and taking the time to listen to their needs, their drivers and the strategic objectives of a project. Once there is an understanding, you can communicate effectively to achieve great outcomes.